MD Green Kratom is an exceptional quality Green Vein Kratom. Without doubt the most potent Green Kratom strain available, a true Kratom connoisseur’s choice. Available by special order request only. This ethically sourced Kratom powder is milled to a super fine consistency for ease of use and preparation. Before processing into Kratom powder, the centre vein and stem of the dried leaf are removed, resulting in a consistently fine grain. The final result is a fairly dark green coloured Kratom powder, containing only 100% Mitragyna Speciosa. You can be confident that the Kratom you order is in stock and ready to ship. Orders completed before 12 midday are shipped on the same day (Mon-Fri). If you wish to buy a larger quantity, and it is not showing in stock please get in touch using the contact form and in most cases will will be able to make it available. Exceptional quality MD Green Kratom leaf powder, ethically sourced from Kalimantan, Indonesia. Kratom is excellent from here, glad I found this store! I am first time user of kratom. I purchased the green melay and the service was very good as it came first class royal mail delivery. the kratom is nicely packaged and resealable. Good service and good product and will purchase other strains. wow, top sellers and quality product at the best price i’ve seen on web: highly recommended!!!! Not into the white strains usually but sometimes I enjoy them. I enjoyed this. Just tried this one and straight away it’s my new favourite green vein. My second choice. I usually burn it 3 – 4 days / week, during my strains rotations. It’s a good tool to recharge the batteries after a hard day of work, it helps to ease the tiredness and after one hour or so it becomes gently relaxing. I have been burning kratom every single day for over two years. I think that this MD Green is possibly the strongest and longest lasting strain I have ever tried. This MD Green Kratom is of Superb quality! I would also like to mention that the delivery is always fast (I live in Europe and even with standard International shipment I always receive the goods in 3-4 days). What’s more the customer service is exceptionally friendly ! Unparalelled! I am honestly amazed by the service of Kratomsupply.net. This strain is amazing to use during the daytime. Very powerful aroma lasts all day. I don’t recommend using this strain at night though you will be awake until sunrise listening to music, creating art talking to your partner about how beautiful she is, writing poetry etc etc. Use red strains in the evening for a more relaxing scent. This vendor has become my one and only. Perfect packaging, quick delivery and the products speak for themselves. Brilliant in every way. Don’t be fooled by the low price tag… this is genuine high quality MD, with all the punch and potency you’d expect from such a strain! The packaging / presentation is aesthetically very tasteful, with a functional aspect which more than lives up to it’s professional look. The air seal is of very high quality, ensuring unparalleled (at least in my experience) freshness. Furthermore, the bags are very sturdy and practical, providing excellent storage solutions. Customer service is the best I have yet encountered – emails were replied to promptly, professionally and with a meticulous attention to detail that only a genuine enthusiast could provide. Postage, again, is better than any than any other UK vendor I have used i.e. extremely quick, and FREE (within the UK). An altogether unparalleled service, which quickly became my ONLY (not just favorite) Kratom Association Certified vendor. I’ve tried a lot of strains from a lot of vendors and this is by far my favourite. I personally consider this to be superior to Green Malay, which is another favourite of mine but without quite as strong of an aroma. I’d definitely recommend this to anyone looking for an uplifting aroma that is long lasting. This is some top notch stuff. Impeccable quality, soothing yet revitalizing aroma and a long lasting burn. My new favourite. Look no further, this is the best green MD available. Nothing but good feedback for this vendor, and I’m happy to report the same. Very good service. Thanks guys. 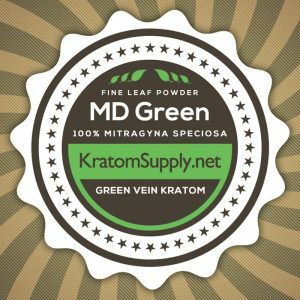 MD Green is a great place to start for a kratom newbie like me. I have found the aroma quite marvelous, it manages to be both energizing and relaxing at different points of the experience, a fairly gentle glow. I urge anybody who’s unsure to give this a try, it’s really quite wonderful. A plus in the box for nature’s bounty. (Bali and Malay, reviews to follow). I highly recommend Kratom to everyone! Find a strain of Kratom that works for you and you will never look back. This cousin of the MD red is a great day time strain, it provides a satisfying uplift and is energizing and motivational before winding down to a relaxing tranquility. My favorite green vein alongside the Malay. Thanks for your fast dispatch. I came back as your customer service seemed pretty good compared to waiting for others to respond. So theres some positive feedback!